2013 Golden Globe Winner Julianne Moore wore Bulgari diamond earrings in yellow gold, a vintage snake cuff in yellow gold with emeralds and diamonds and an 18K Yellow gold emerald ring in January. The holidays are quickly ending but my favorite time of the year is just around the corner… Award Season! Last year carpets all over Hollywood glistened with gold. It even proved as a good luck charms for award winners like actress Julianne Moore. Like most fashion fanatics, I cannot wait to see who wears what, especially when it comes to the accessories! As we eagerly await 2014's glamorous season (starting January 12th with the Golden Globes), let's take a look back at some of my favorite gold looks from the red carpets. Jennifer Garner was just one of many who glowed in gold at the 2013 Golden Globes. The actress, mom and wife to Ben Affleck wore yellow gold and diamond hoop earrings and yellow gold bracelets. OJ&B fave and powerhouse singer Adele shined as bright as her voice in Van Cleef & Arpels 1971 "Estate" earrings featuring diamonds set in 18K yellow gold from their Heritage Collection. The earrings were absolute perfection especially for a bond girl. Actress Kate Hudson exuded glamour at the 2013 Golden Globes wearing Jennifer Meyer gold earrings and gold rings. If there is one thing that women like Adele and Kate prove it is that blonde and gold go perfect together! 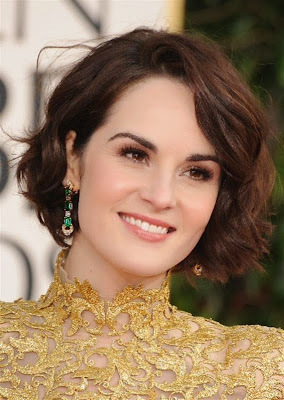 Michelle Dockery joined Julianne Moore in the Bulgari club by wearing Bulgari emerald and diamond earrings in yellow gold, an emerald ring in yellow gold and a yellow gold cuff. Nothing stuns more that yellow gold on a red carpet. The Oscars are known as the Superbowl of fashion and these ladies are part of the reason why this statement is 100% true! Salma Hayek is one of my favorite actresses and her look at the 2013 Oscars was on my best dressed list due to her Cindy Chao yellow gold and diamond chocker worn as a hairpiece. I think that hair pieces are going to be a big trend on the 2014 carpet along with golden ear cuffs. The always beautiful Nicole Kidman looked chic as can be in Fred Leighton 19th century yellow gold and black enamel pendant earrings and a yellow gold and diamond chain cuff bracelet. I have a feeling that gold and statement are two words that you will hear a lot of in 2014 during award season. Those earrings were everything and topped off the look perfectly. Jessica Chastain killed it with this Harry Winston vintage 1967 yellow gold and diamond bracelet. One thing I love about gold is how well it photographs. It looks amazing on any skin color and it is guaranteed to stand out amongst the crowd. I love House of Waris and his 18K yellow gold House of Waris for Forevermark Light Emanating from the Heart pendant with oval Forevermark Diamonds. It was brilliantly placed on Samantha Barks. I feel like there will be a big return to statement necklaces for the 2014 award season. Last but not least is the beautiful Olivia Munn who look radiant in a pair of yellow gold flower stud earrings. When you have a fabulous pair of yellow gold earrings, you don't need much more to dazzle on the carpet. Gold definitely made a dent during the 2013 award season but as I said before, I predict that it is going to explode on the carpet in 2014. I know that OJ&B's friends at LoveGold will be in LA making sure that all of the glamourous Hollywood movie stars have access to the very best in gold. I cannot wait for the fashion games to begin!